A newly released report has given the naming rights value of all 20 Premier League stadiums including St James Park. Duff & Phelps are the ‘premier global valuation and corporate finance advisor’ and they have updated their Stadium Naming Rights study. Back in 2013, they estimated the value of all 20 Premier League stadiums’ combined naming rights at £74.6m for the 2013/14 season. Four seasons later, for 2017/18 they believe there has been an 80% increase, with the combined value of the 20 PL stadiums being £135.6m for the 2017/18 season. 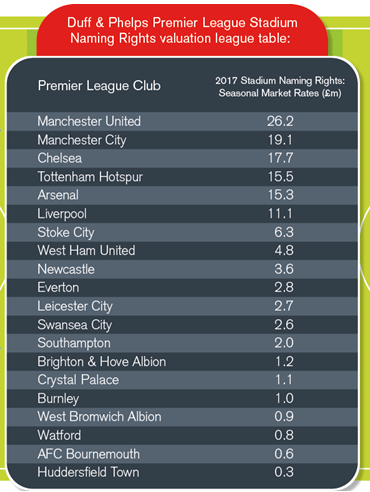 No surprise to see Old Trafford rated at £26.2m per season if offered for naming rights, which is £7.1m more than Manchester City in second place. The top six clubs who regularly get exposure in European competitions as well as the Premier League, account for over 77% of the £135.6m potential money the 20 clubs could attract, according to the Duff & Phelps report. ‘With its 52,405 capacity at St James’ Park and dedicated fanbase, Newcastle United ranks in the top half of the table. Leicester City FC, 2016 Premier League winners, have already secured a naming rights deal, and come in at mid-table in the naming rights league. As you can see, Newcastle come out of it as ninth highest, with an estimated £3.6m per season valuation. Obviously the report is using a lot of guesstimating in their figures. Interesting to see they value Newcastle (based at least partly on how many times chosen for live TV coverage?) above all but the top six and Stoke & West Ham, with the likes of Everton rated lower. As for the Stoke City anomaly, that will be due to the fact that along with a number of other clubs, the Potters already have a naming rights deal. Presumably that £6.3m figure is what BET365 are currently paying. The owners of BET365 are also owners of Stoke City and as opposed to Mike Ashley who gave naming rights for free to his Sports Direct brand, the Stoke owners look at this as a way to get MORE money into the club, not a free spin-off for something else that they own. I assume no Newcastle fans would see St James Park renamed for £3.6m per season as a good idea. As to what figure supporters would possibly consider, if new ambitious owners were in place, as a good deal to make…is open to question.